"Casas Caiadas" é uma casa boutique perto de Évora (património da Unesco), concebida para acolher famílias ou grupos até 10 pessoas. Você vai encontrar 4 casas independentes, totalmente restauradas a partir de um núcleo de antigos moinhos de água, no coração de um Alentejo com canais, paisagem verdejante a maior parte do ano e rochas megalíticas. A "Casa Social" é constituída por uma cozinha, sala de estar e sala de jantar: o local de encontro por excelência, muito acolhedor, onde os objetos artesanais se combinam com grande elegância com mobiliário e peças minimalistas. Nesta casa, além do café da manhã (incluído), pratos locais e deliciosos podem ser preparados em todas as refeições por um cozinheiro - famílias hospedadas podem decidir, a cada dia, se desejam preparar uma ou duas refeições, ou se preferirem prepare-os eles mesmos. As outras três casas são, respectivamente, suítes instaladas nas Casas "Stone" e "Care Taker", e, por fim, a "Casa Caiada House" com mais 3 quartos: uma suíte (quarto + banheiro) e 2 quartos com compartilhamento banheiro. A piscina tipo praia instalada entre uma antiga via fluvial das usinas mantém sua forma mais natural. Um lugar para relaxar por um riacho que corre entre as pedras, cercado por oliveiras centenárias, menires e uma piscina de praia. Ao redor de Casas Caiadas (casas caiadas de branco) há fabulosas rodadas de campo para explorar: caminhar ou andar de bicicleta (3 bicicletas disponíveis). Nas proximidades, há aldeias de beleza única e interesse histórico, com castelos e outros monumentos, ótimos restaurantes e vinícolas (informações detalhadas disponíveis mediante pedido). O Alentejo tem estações distintas, com uma nascente verde rica em flores silvestres. No início do verão, as cegonhas constroem seus ninhos nos telhados das aldeias caiadas de branco, e o calor transforma as planícies em ouro. E quando a noite cai, o céu oferece a chance de contemplar as estrelas com condições de visibilidade como nenhum outro lugar no sul da Europa. Nas Casas Caiadas é como se estivesse sozinho no mundo, apesar de a pequena aldeia de Sabugueiro estar localizada a pouco mais de um quilómetro de distância ... perto de Évora, o autêntico Alentejo! Casas Caiadas é acessível por uma estrada rural. Está localizado a 1 km do Sabugueiro, a 15m de Arraiolos, a 30m de Évora (património da Unesco) e a 1 hora de carro de Lisboa. Casas Caiadas já foram publicados livros “Portuguese Restored Houses” e “Arhitext”; e outras mídias especiais como “Wallpaper *”, “Sunday Times”, “Architectura y Diseño”, Archilovers (Melhor Projeto 2015), “Architizer”, “Archdaily”, “Divisare” e “Attitude”. Visite as Casas Caiadas na nossa página do Face book ou simplesmente Insta-nos. Try this....on your first morning, if you can be bothered, get up early, make yourself a coffee, sit at the table out the back and just listen. I’m not going to tell you what you’ll hear, but trust me, it’s a worth while experience! Simply idyllic, whether sipping a glass of wine and gazing at the stars, eating a beautifully prepared meal by Anna in the guesthouse or just cooling off by the pool. The hosts and staff are great. Good location for exploring Alentejo. Would definitely recommend it. There is a nice grocery 15 minutes away in Arraiolos- Intermarche. A wonderful retreat away from it all. Casas Caiadas is set in a beautiful remote location in the heart of the rural Portuguese farming community where agriculture meets wilderness. Casas Caiadas is stunning in its simplicity, retaining the structure of the century’s old water mill, finished in smooth white painted walls featuring natural stone nooks and crannies. Internally old rustic furniture contrasting with contemporary mod cons made for a relaxing ambience. The beach style infinity pool is of a real state of the art design great for both paddlers and swimmers alike. We really appreciated having breakfast made for us each morning with an amazing choice of food to keep you going all day. Whilst we were enjoying our breakfast our beds were being made and bathroom facilities cleaned. Each morning before breakfast and before the sun got too hot, those of us, who managed to get up, went for walks or jogs out along the isolated lanes that meander through the ancient olive groves. It was so nice just to hear the sounds of the wildlife and see unspoilt countryside all around. We had a traditional Portuguese fish dish cooked for us in the villa on our first night which was of the highest standard. It was our preference to eat in on subsequent evenings taking in turns to cook in the well equipped kitchen. The nearest fully stocked supermarket is some distance away but visits can be combined with day trips to places of interest; we especially recommend a visit to the walled village of Monsaraz. Compared to the UK we found the local roads almost deserted and parking easy and free. The stars are quite spectacular after dark as you look up from this rural setting. It can make you ponder your existence on planet earth as you spot another shooting star across the night sky. For my wife the highlight of our stay was laying pool side in this peaceful and enchanting environment. For me it was exploring the olive grove wilderness walking alone or on mountain bikes with my son. My daughter enjoyed the opportunity to do some undisturbed research reading in the cool inspiring space that was the old water mill. All in all it was a lovely & memorable family holiday made the more so by the attention to detail and consideration of the owner Mario Domingues. In July we spent one wonderful week at Casas Caiadas. The owner Mario took great care of us before and during our stay. Everything was well-organised and uncomplicated. He welcomed us at this magnificent spot, showed us around and gave us all information needed. He and his wife Paula are very friendly and attentive hosts. Everything looked exactly like we had expected it due to the photographs and description of the accommodation. The houses are very clean and always looked after by Claudia the housekeeper and chef. She prepared a great breakfast each day - and when requested - also dinner, which was also very delicious. Everything was very fresh and we enjoyed delicious regional food and wine. Casas Caiadas is a really special place. The buildings of this former watermill were restored with love, in great detail and equipped in a very clear, authentic but stylish way. The beachlike pool was the perfect refreshment for these hot summer days and our favourite place to be. The property is very spacious and you can enjoy pure nature and utter solitude - the perfect place for relaxing days. For us the best accommodation to "disconnect" - as Mario calls it - and he is right. This is really the perfect title to describe our stay at Casas Caiadas. 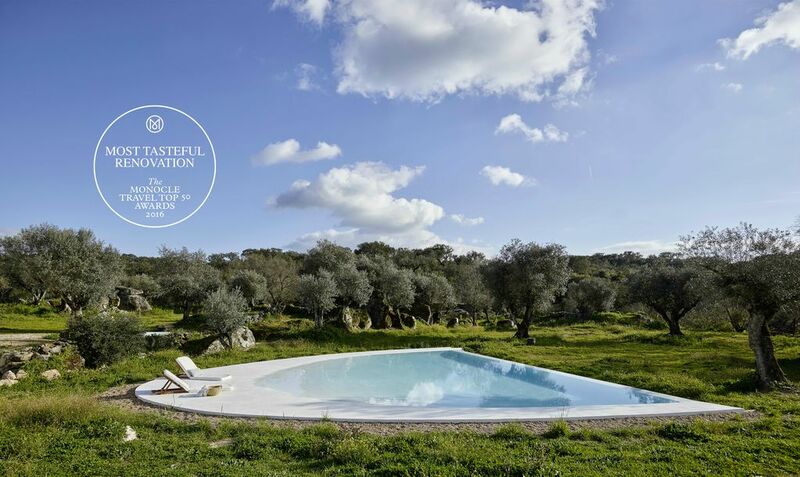 In the middle of a distinctive landscape in Alentejo, three small traditional houses emerge where you least expect. The scent of the land, the silence of the location, the birds in the morning, the perfect light of the sunrise, are incomparable. In the inside, you feel cozy, the design and the modern decor leave nothing unintended. It is the perfect place to read a book, have a simple family gathering or just escape from the everyday life. The property is spot-on in every detail. Claudia is an amazing chef and an helpful hand when you need. Paula and Mário, the owners, are two big hearts, perfect to welcome and guide you in your stay. Hopefully we will be able to come back soon. IF GUESTS NEED TO CANCEL OR MODIFY THEIR RESERVATIONS AT CASAS CAIADAS, THIS WILL HAVE TO BE MADE WITH AT LEAST 2 MONTH IN ADVANCE FOR TOTAL REFUND. IF THE CANCELLATION IS MADE CLOSE TO THE ARRIVING DATE, WE WILL DO OUR BEST TO RENT THOSE DAYS AND REFUND THE SENT MONEY, DEDUCTING 10% FOR ADMINISTRATIVE FEES. IF NO SUBSTITUTE GUEST WILL BE FOUND FOR THE CANCELLED DAYS THERE WILL BE A 50% REFUND OF TOTAL STAY.